Upon unpacking your dolly, please REMOVE ALL TAGS before giving to a child. She may be a little crumpled from her journey. Her little clothes may need a quick iron on a warm setting. Run your fingers through her tutu if she has one to separate the tulle and fluff it up. 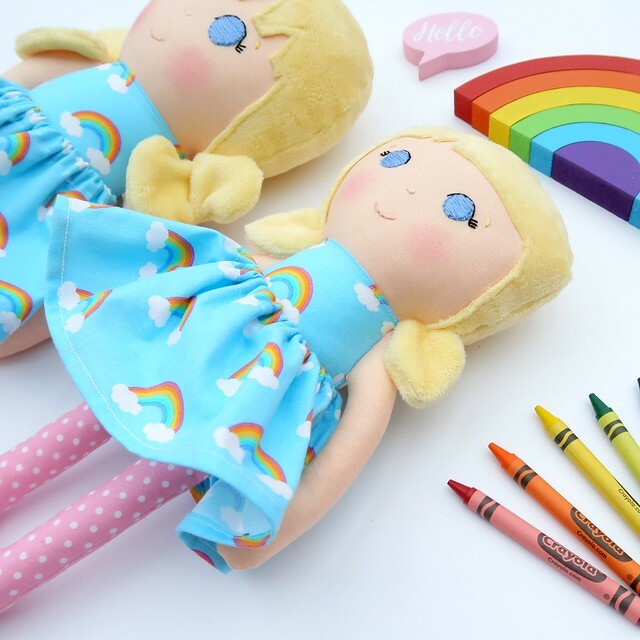 Little Sugar Plum dolls are made from 100% cotton and 100% merino wool felt. They are precious and should be looked after with love and care to keep them looking their best. To maintain the beauty of your Little Sugar Plum doll, you can run a lint roller over her which will brighten her up in an instant. If your dolly is heavily soiled she can be machine washed on a 30℃ cycle and hung to dry. Please DO NOT tumble dry. Please be aware that due to the nature of the wool in the felt hair and accessories, this may bobble over time/ after washing, and the dolly's blusher will wash off. This can be reapplied using a mineral based powder blush. Dolly clothing can be machine washed with the exception of fairy wings, felt hats and tutus. These items cannot be machine washed. Please spot clean with a damp sponge, or hand wash in cool water before hanging up to dry. DO NOT TUMBLE DRY. Dolls clothing can be ironed on a warm setting avoiding trims. Do not iron tutus. Iron felt items underneath a tea towel to protect fabrics.